It's a bit heartbreaking when you wake up in the morning and see an email from your mother with the subject line "Gooseberry Fool." Turns out she was just passing on a recipe that my grandmother got from one of her older relatives. We don't have gooseberries yet, but I thought I'd record the recipe for posterity. That way, we can give it a shot once we're swimming in gooseberry fruits. "This is a recipe Ruth made for us June 20, 1980 with her berries. I guess you can do the same with raspberries. 1qt. 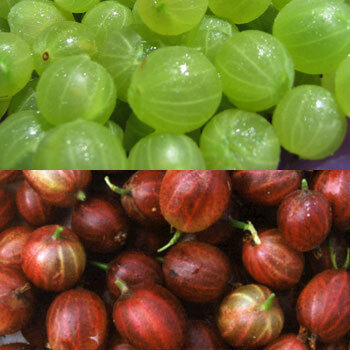 green gooseberries. Put in sauce pan with cold water to cover and bring to boiling, but remove from heat before fruit cracks and juice escapes. Strain off water, let cool and press thru colander with a wooden spoon, adding sugar and a little milk at same time. Sweeten again to proper taste and add more milk if necessary to bring to proper consistency. Serve when cool with whipped cream or regular cream. Strained juice may be used in drink. "Perhaps with raspberries you will need a little lemon juice to make milk thicken, and not so much water, but more berries." Check out Mark's homemade chicken waterer.